What is the EVRacing TRT ShootOut Series? Its simple... There will be a track announced on Monday. Also announced will be how many laps. You can run the track as many times as you like during the week. (Until 8 am CST Monday Morning) You can also run the track at your preferred track wetness. On the following Monday the results will be announced. You must run on an EVR server to get your times counted. Points will be rewarded for the fastest (TRT) session of the registered racers on the track. What are the EVRacing TRT ShootOut Rules? The EVRacing 'TRT' Schedule Follows the MARS ST'06 'IceMelt Tour'. Please do not repost the add-on tracks that we use in our competitions without seeking proper permission. We at EVRMSG wish to give credit to the track developers and the websites that host the tracks. Special Thanks go out to the Track Creators! Without their many hours of invested time and sacrifice into these Dirt Speed Bowls, the MARS series would not be able to enjoy such a strong variety of tracks to run at. The competition might not be as fierce, the fun factor might not be as high, and the racing action would surely not include as many "Wahooooo's!!!" 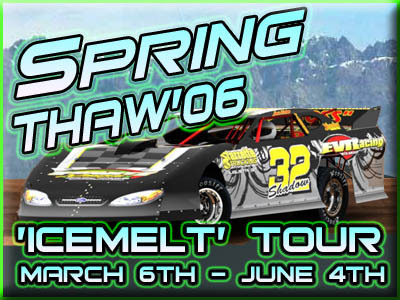 *NOTE* - For the Spring Thaw '06 TRT 'IceMelt Tour' we are racing LateModels only!!! The EVRacing Motorsports name in whole or in part is the property of 'Extreme Velocity Racing MotorSports Group'. DTR2, DTR and DTRSC are registered trademarks of 1999 RatBag Pty. Ltd. The operators of this website are not affiliated with, endorsed by, or sponsored by RatBag Pty.Ltd. The official DTR2®, DTR® and DTRSC® website is Ratbaggames at www.ratbaggames.com. Dirt Track Racing 2, Dirt Track Racing and Dirt Track Racing Sprintcars are registered trademarks of RatBag Pty.Ltd. The Papyrus, Sierra and NASCAR logos are registered trademarks of their respective corporations and are not affiliated with this site in whole or part. Website Copyright ©2004 by Extreme Velocity Racing MotorSports Group. All Rights Reserved. Site Designed By Adam Zuidema.